He is far more complicated than his reputation as the sentimental bard of an idealized rural life. I've used pictures here that were not published in The Wall Street Journal. To see "American Gothic," a self-portrait, "Parson Weems's Fable" and "Spring Turning," please go to the WSJ site. Not far into " Grant Wood: American Gothic and Other Fables" at the Whitney Museum of American Art, visitors meet the probable cause of their visit: the stern pair of Iowa farmers who inhabit Wood's iconic painting. "American Gothic" (1930) is so renowned that when it arrived in London last year for an exhibition, the Guardian called it "a huge moment" because, save for its appearance in the same show in Paris three months before, this arguably "most famous of all American paintings" had never before "left North American soil." The writer, like many others before and since, then described the duo as a man and his wife—not, as Wood said, a farmer and his daughter (later acknowledged in a footnote to the article). 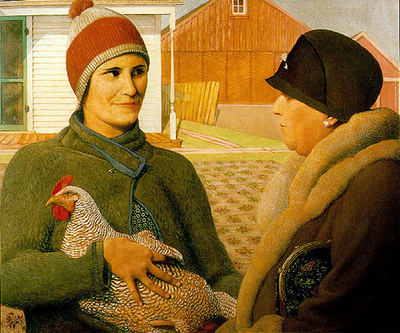 So it goes for Grant Wood (1891-1942), who is often misunderstood. With the aptly named "American Gothic and Other Fables," curator Barbara Haskell offers a corrective. In a display of nearly 120 works, she argues that Wood is far more complicated than his reputation as the sentimental bard of an idealized rural life and an evangelist for a pure strain of American art allows. The exhibition covers Wood's entire career, beginning with his decorative Arts and Crafts objects, such as a silver coffee pot (c. 1914) and a wrought-iron fireplace screen (c. 1929-30). It displays his early Impressionistic works, his commissioned murals, and a gallery of posters, book illustrations and magazine covers (1932-40). All are proficient—some beautifully so—and most of them can be read straightforwardly. Nor is there anything dark, for example, about his sprawling "Dinner for Threshers" (1934), a cutaway look inside a farmhouse at men coming in from the fields to eat together. Highly detailed, unified by repeated forms and patterns, the frieze-like painting portrays a farming ritual. It also alludes in structure and design to the "Last Supper" paintings by both Leonardo da Vinci and Giotto as well as to religious triptychs of that era. Yet many paintings Wood made during his mature period, from about 1930 to 1942, after he had fused his own sharp, clear-eyed style, do seem to carry something of a psychological dimension—if not always a sinister one. His stylized landscapes are not "real," based on factual observation. One glance at " Young Corn " (1931), with its bulbous trees and swirling fields, or at "Stone City" (1930), a rolling, depopulated landscape ribboned with whimsical trees, attests to that. At a time when the U.S. was dealing with the Depression, drought and disillusionment, Wood was trying to recapture, as the catalog suggests, the "dream-power" of his childhood—implying the tension between then and now. Note, too, that Wood has painted these naïve scenes from above, one step removed from the earth that had grounded him before his beloved father died, before his family left the farm for Cedar Rapids, and before he began to feel the estrangement of being a sexually repressed, probably gay man. Wood's portraits are often sad, or wistful, if not fundamentally freighted with anxiety. 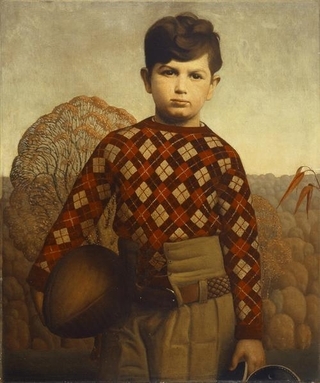 Works like "Plaid Sweater" (1931), which portrays a solemn young boy holding a football, and "Woman With Plants" (1929), which depicts his mother holding a sansevieria plant, known for surviving tough conditions, indicate that all is not well in the rural America he supposedly idealized. But what of "American Gothic"? What paintings here could secure Wood's reputation without it? "Daughters of Revolution" (1932), a sendup of three haughty women standing before "Washington Crossing the Delaware," and " Parson Weems' Fable" (1939), recounting the tall tale of Washington chopping down the cherry tree, rank among the candidates. For pure magic, there is "The Midnight Ride of Paul Revere" (1931), which illustrates Longfellow's poem in a charming, storybook way, with perfect homes, lights too bright for the period, and a toy horse. Wood's virtuosity as a painter, technically, is everywhere evident—the velvety green mounds of "Spring Turning" (1936) are just one example. 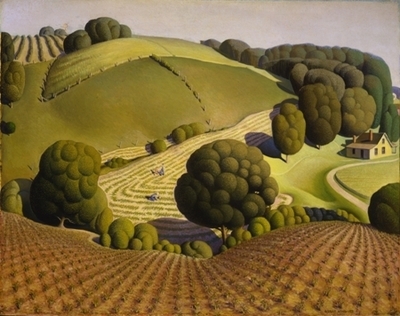 Then there is "Appraisal" (1931), normally on view at the Dubuque Museum of Art. In it, a young woman in country clothes is hoping to sell her beautiful chicken, its eye warily meeting the viewer's, to an older city woman in a fur-trimmed coat. It's a collision of rural and urban, young and old, struggling and rich. Far from romanticizing rural America, it's an emblem of the unsettling shift from family farm to industrial production. In its anxiety and ambiguity, it is (for me) at least as deep as "American Gothic." Still, when asked, Ms. Haskell said she could not countenance a Grant Wood exhibition without that popular icon. Not yet, anyway. By giving him broad exposure, this exhibition could very well change that.